WELCOME TO THE PEBBLES BASICS BLOG HOP & GIVEAWAY!!! This is how today's blog hop is going to work...Visit each blog, leave a sweet note and in some cases enter to win a Pebbles mini giveaway. Once you've stopped by each site, go back to the Pebbles Blog and enter to win a collection of Pebbles Basics products worth $200 (that's a lot of product folks!). 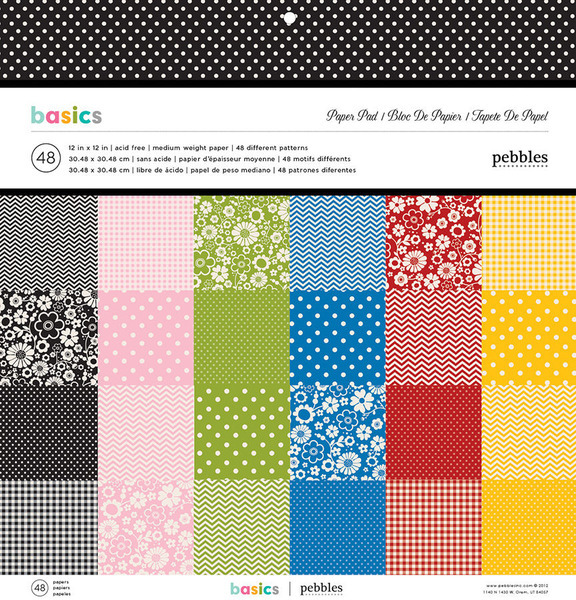 This is the layout I created using the Pebbles Basics collection. This collection is just that, a group of basic paper crafting supplies that are perfect for scrapbook layouts, cards and other paper crafting projects. I love the bright, bold colors and patterns that are used throughout this collection. I several fun and simple tips to share regarding my layout that may help you stretch your scrapbooking supplies and think about using them in a different way than you would expect. To start, I created the mat for my photos on the left hand side using two sheets of from the Journaling Basics Cards Pad. I overlapped them, matched the patterns and then trimmed them to size. The two scalloped border strips at the top right and bottom left of the layout are from the strip along the top edge of the yellow patterned paper. I cut it in half and used it as a fun accent and place to position my flower embellishments. I hate to waste pretty paper! 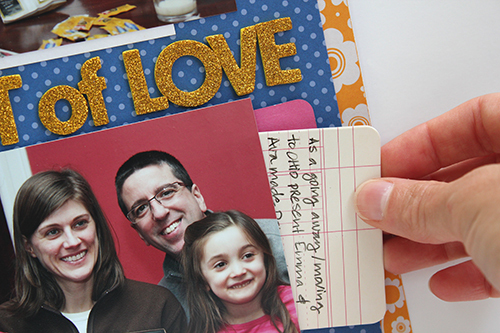 Another tip I have to share is that I used one of the Basics Library Pockets to hide my journaling behind one of my photos. I attached the pocket behind the photo, leaving just a small edge of it peeking out from behind the photo. To read the journaling, all you have to do is pull out the card. The layered flowers were made using a FREE digital cut file that I designed. I cut the different layers from various colors of cardstock. Then I used American Crafts This To That Foam Tabs to layer them and create more dimension. The centers of the flowers are extra dots from the American Crafts Honeycomb Glitter Thickers! 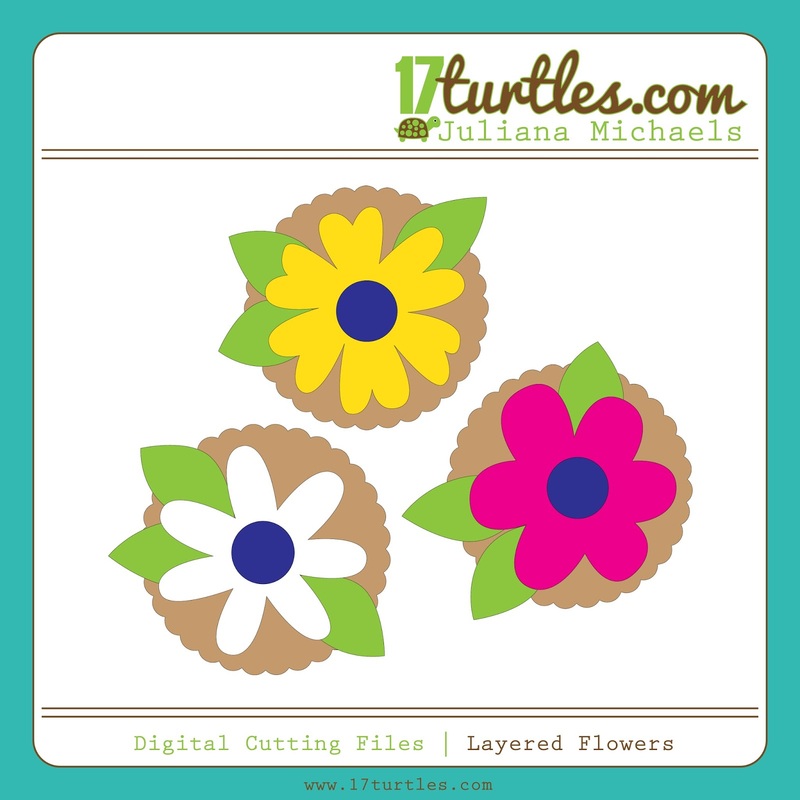 You can download my FREE digital cut file and use it to create your own layered flowers for your next crafting project. I have a Pebbles Basics Paper Pad, 2 packs of Thickers, Washi Tape and Clothespins for one lucky person who leaves a comment below! You will have until Friday, September 6 to leave a comment! Thanks so much for stopping by and I hope you enjoy the rest of the Pebbles Blog Hop!!! Don't forget to stop back by the Pebbles Blog for your chance to win the BIG prize mentioned above!!! Great layout and great giveaway! Awesome page as always! Love the pocket and card. What a wonderful LO! I loved your tips on how you created it - the scalloped border is definitely something that needed to be shown off! And thanks so much for the wonderful cut files! Those are such sweet flowers! Thanks so much for all you've shared today!!! 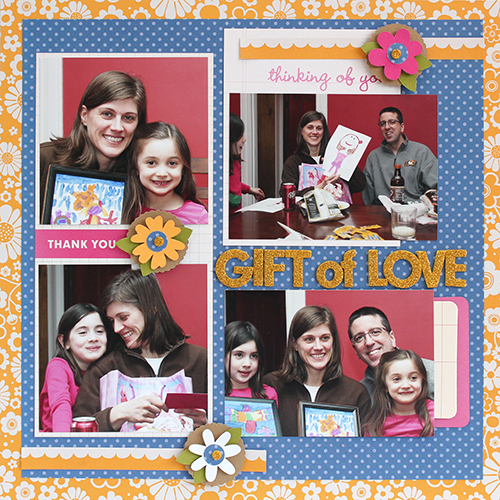 Cute flowers and so love hearing your thoughts behind your layouts! What a fabulous page Juliana!! Love it!! yay for free, thanks for the cut file! ps, you used one of my favorite things, library pockets! Such a great layout! I like how it highlights your photos perfectly! thanks for the chance and for the flower download! Sweet page! Love the sparkle and shine on the title letters. Love your layout and love the hidden journaling! Awesome giveaway! Thanks for the chance to win! This is gorgeous!! I loveeeeeeeeee the colors,the flowers and the photos!!!! Great layout and awesome giveaway! Thanks for the chance to win! Just love the colours and the talent you have in being able to make and share these cut files :) Big Hug!! Great layout! Love the flowers. Thanks! I love the basics collection! The flowers are awesome. Thanks for the chance to win. The flowers are too cute!! Thanks for the cut file! I love using hidden journaling, and those pockets are just perfect for it :) Great layout! Very sweet layout! Love the hidden journaling and those great flowers! 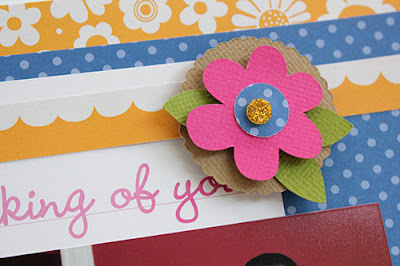 The layered flowers are such a beautiful accent to this bright colored fun layout!! Very well done - love it!!! 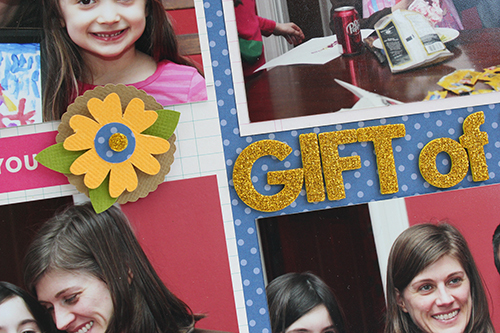 Love all your tips and your layout Juliana, thanks so much for the digital cut file. What a beautiful layout and gorgeous family! Love your hidden journaling pocket! Fantastic layout,I love the color combination! Adorable page, Juliana! Love the hidden journaling you added! Great layout, love the bold colors! Awesome giveaway! Love the bold colors in your layout! As always, you've created a wonderful layout and left me feeling inspired! I especially appreciate the tips and the free cut file, as I will very soon be getting a Silhoutte for my birthday :) Thanks so much for the chance to win some awesome goodies! That's one awesome cut file. Thanks. Thanks a lot for the flower Freebie!! Beautiful layout, Juliana! I just love the photos and that fun grid design! Your flower cut files are so sweet. Really love the creative use of the Thickers for the flower centers! Pebbles Basics worked great for your page ~pattern sets off pictures nicely without being too busy. Like the hidden card! Love the grid layout. Super Cute! Wonderful layout. The color combo is great. Your photos are so neat. What great memories. Thank you for the file and the chance to win some wonderful goodies. Great layout - love the papers you used as well as the cute flowers. Great giveaway too. Love the multiphoto design! GREAT layout!! Beautiful Page, thanks for the download! Thanks for the great tips on stretching your supplies. I also hate to wsste paper!! Love this simple but fun layout. Very cute! Great tips and I like the polka dot background. Sweet layout and thank you for the tips and the cutting file! So simple and great layout! Thanks for giveaway! Love the blue and orange together! Love the hidden journaling too! Such a great LO! Love your colors and the hidden journaling! Thank you for the wonderful cut file! Love your very creative ideas. Great layout, thanks for the chance! Good advices about scrapbook supplies! i'll take them! I just love the paper you used as cardstock, i have it too and is so beautiful!!!! Beautiful layout! Love the papers! Thanks for a chance at your great prize too! I love your tips - especially the journaling one - thanks so much for sharing them and for the cut file it's precious! !